As we head into Week three of 2015, I’ve seen many writers talking about their yearly goals and most have included a publishing benchmark on the list. Some are looking to become the next big Indie success story and chasing that publishing dream may require more money than these writers initially expected. Believe it or not, there is a cost to self-publishing. In a tight marketplace, it often takes a successful looking product to be a successful product. That means new authors may need to cover the costs of editing, buying an ISBN number, acquiring cover images, hiring someone to design and layout the cover. And lastly, one really should have the EPUB professionally formatted, an expense too many new writers try to skip with mixed results. And that is not addressing the costs associated with print books, especially those with lots of color images. Even if the author manages the production expenses, they will still need money for marketing to sell at books. So where will all that money come from? Well, many authors are turning to Kickstarter, Pubslush, IndieGoGo or one of the other crowdfunding facilitators to pay for it all. If you don’t know what crowdfunding is you can learn more here. In short it’s a way for anyone to raise capital through organized social media campaigns. According to a recent Publisher’s Weekly article, in 2014 the publishing category at Kickstarter had 2,064 successfully funded campaigns and they raised $21.9 million in pledges. That may sound like a lot, but the number of winning campaigns was on the low side, only about 28% of projects found funding. The numbers are higher for comic book writers and lower for journalists, but you can read more about that here. There are advantages and disadvantages to going this route and the results for each author are going to vary. This is considered a controversial alternative. You are asking friends, family and total strangers to help get you started as an author. Is this option right for you? That’s for you to decide, but if you are considering crowdfunding, here are six tips to help you prepare. 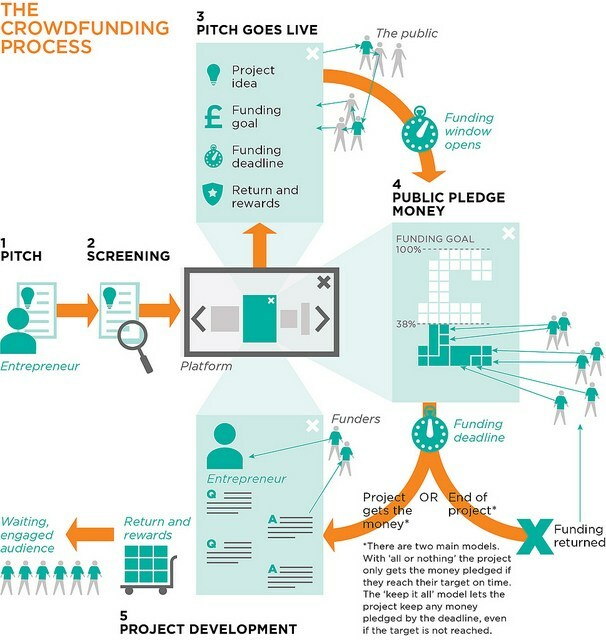 Spend time learning about the crowdfunding process. Look over the site facilitator options. Kickstarter is one of the biggest and best known crowdfunders, but it’s not the only game in town. Do your due diligence. Know how the site will handle the money, and what they will expect in terms of a percentage of your take. Learn the tax issues, and plan accordingly for those extra costs. Ask questions before you sign up. Think about how easy (or hard) the site is to use, and if it has technical support features to help you. Look at other author’s appeals. Read some author success stories. Figure out what you like and don’t like about how other book projects were presented. You may start to notice the well-funded appeals are carefully created pages. They’re well-written, error free and easy to understand. The author has clearly shared and sold their story idea in a few paragraphs. Good campaigns often feature quality images and video elements to help the potential backers get to know the writer and their work. Data suggests campaigns with videos are more likely to get funded than those without. Of course, creating a video adds extra work. More info about adding videos here. Establish which aspects of your background, social media platform, personal contacts and portfolio of work represent your strengths. If you have no social media platform, you’re in for a challenging campaign. Think about your negative aspects and weaknesses. If you see any red flags, fix them before you launch the campaign. This is the time to redo the old author photos, update that glitchy website, and write a new fact-filled, yet fun bio. Think about how you want to present yourself to the public. Revamp anything old, tired or ugly and make it shine. Figure out the bottom line. Create a project budget and don’t leave anything out. Remember some sites require you meet the minimum funding goal, or you don’t get any of the money. Set realistic goals. You don’t want a budget that looks bloated, but you’ll need enough resources to finish the project. Talk to people with experience, and get help if you’re math challenged. A good campaign should include the budget in the appeal. You’ll need numbers you can stand behind. Never overlook the power of prizes. I attended a charity action where someone paid $10,000.00 (US dollars) for the opportunity of naming the villain in an author’s next book. And when the winner’s friend complained about the bidding ending too soon, the author gave away a second character naming and earned the charity another $10,000.00 dollars. Granted, this was a big time author, but the theory is the same. Unique prizes trigger something chemical in the human brain; people get a high off getting a goodie no one else has. Arrange for a large number of small prizes for pleaders at the lower pledge levels, but have something fantastic at the top levels too. Every hour you spend preparing for your crowdfunding appeal will be time well spent. Next Up from Robin… I’ll be giving some tips on landing grants, fellowships and residence programs. Book Cover Art: Did You Get What You Paid For? I fear as soon as this becomes a common practice, it will burn itself out. Too many requests will cause donors to pull back. It will be interesting to watch this trend and see what happens. It’s already a hit and miss situation. It all depends on the demand for that book, and how much excitement the author can generate from the potential backers. I agree with you. It will be interesting to see where this trend is in a few years. Hopefully it will still be going strong. Thanks for sharing your thoughts. So thoughtful and informative. Thank you! Thanks! We’re changing up the blog a bit this year. That means we’re looking for more topics we haven’t covered before, and this one seemed perfect. And timely since Publisher’s Weekly had just covered a related aspect of crowdfunding. Thanks again for the comment.